Every August we begin a slow descent into mourning summer. Every September we quickly speed into anticipating fall. Our last camping trip of the year was thwarted by loads of rain, the campground we had reserved flooded. Fall camping may very well be my very favorite, but instead the kids enjoyed nature's playground afforded by all the rain. A stream ran through our backyard and created a giant puddle. It floods so often in the same spot in our yard, the boys running, splashing, digging in it, that grass no longer grows there. It is a barren blemish in a field of green grass. This only bothers my husband, who can be heard yelling, "No digging!" quite often from the deck. Jillian got in on the splashing this time and I'm fairly certain she won't want to miss out again. The camper may be winterized, prepared to sit through another brutal winter, but we're embracing the current season before we're shut up indoors for months. 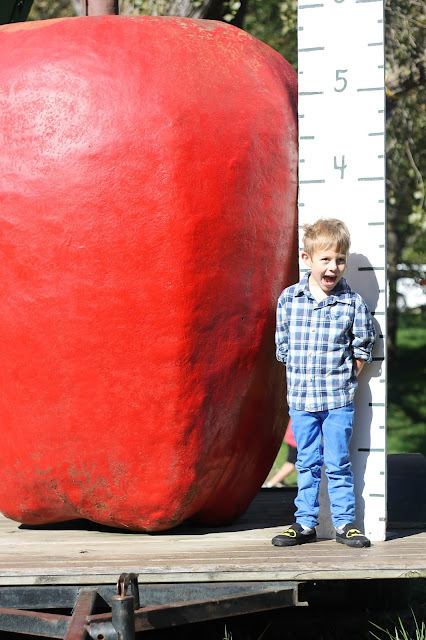 This weekend we hit up my favorite fall activity: the apple orchard. It was a seasonably warm day, allowing us the luxury to run around in light clothing instead of the bulky layers and hats we don some years. 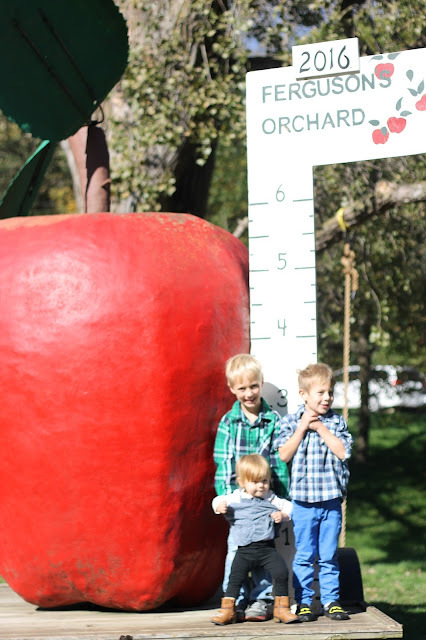 As the kids lined up to take their annual picture in front of the ruler by the giant apple, it hit me that it is Jillian's first orchard measurement. Last year she was a rounded bump in my belly as I waddled around the farm. This year Dave propped her up by the ruler and she clung to it as I snapped her very first photo-op. Her head was just shy of clearing the 2 1/2 feet marker. 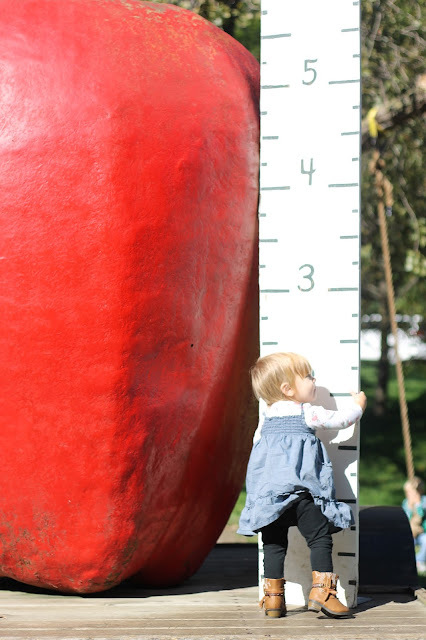 Once upon a time Spencer was a fresh one-year-old visiting the apple orchard for the first time. Now he's off flitting from one activity to the next. 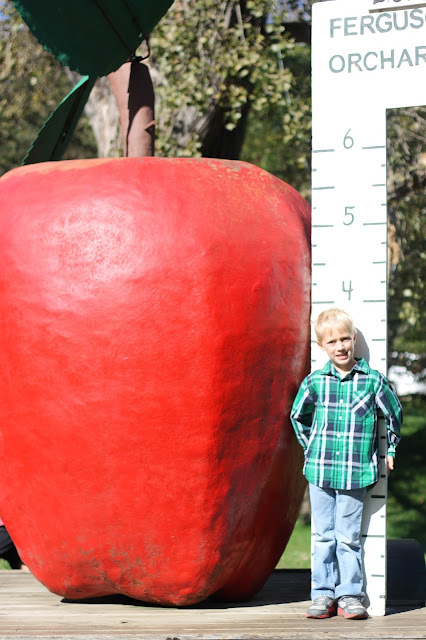 One day when the kids are gone and my house is quiet, I'll look through the pictures of our annual orchard trip in wonder, watching their heads clear taller notches on the ruler year by year. If every August we mourn summer, September we anticipate fall and November we dread winter, October is definitely the month we take hold and embrace. This particular October will be filled to the brim and gone in a flash. Two birthdays, a wedding, and Halloween. Happy October.